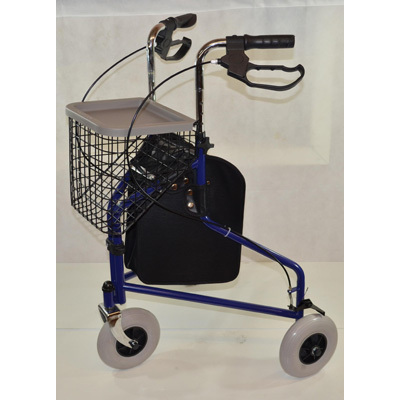 This triwalker or 3 wheeled rollator is a high quality steel mobility aid available for a limited time at a great price. This triwalker or 3 wheeled rollator is a high quality steel mobility aid available for a limited time at a great price. It features a steel frame, cable pull loop handle brakes and includes a bag, basket and a tray. The handle height can be adjusted for the user. It weighs just 6.8 kg and has a safe user weight of up to 125 kg or 19 stones. This model is available in blue only.